Imagine hobbling around or being carried for nine years and then having surgery and the very next day starting walking like all your friends. This is the story that Kara Myers relates in this MissionCast. She met a nine year old girl in one of the pediatric wards at the Ludhiana Christian Medical College. Before surgery her deformity caused her to walk on tippy toes on one of her feet. The day after surgery she was standing flat on that foot for the first time in her life as she began her month long physical therapy. Imagine the difference this will make in her life. 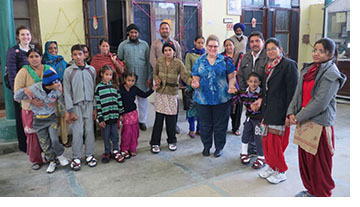 Kara Myers from Grace United Methodist Church in Leeâ€™s Summit and Rachel Sapp (shown several times in this MissionCast) from Huffman Memorial United Methodist Church in St. Joseph just returned from India where they learned about the Ludhiana Christian Medical College started by a missionary woman over 100 years ago to train women nurses and doctors. It is now one of the leading medical colleges in India and admits both men and women.